← Celebrating our 11th Anniversary with Giveaways! We are always happy to support our native Idaho fisherman and his family as they are in Alaska right now fishing. It is really amazing that this family has kept fishing a family trade for four generations. Watch our Instagram for photos and updates! Chili Lime Salmon is really simple – perfect for a quick bite. 2 tablespoons organic olive oil ~ Save $2 now on our web site. 1 tablespoon minced garlic (or 4 crushed garlic cloves) ~ You can find chopped garlic in a jar and whole garlic on our web site year round. Instructions Preheat oven to grill/broil settings on high heat. Spray a baking sheet tray with cooking oil spray; set aside. Whisk lime juice, parsley, olive oil, water, garlic, chili flakes, cumin, salt and parsley together t combine. Add the honey and whisk again until the honey runs smooth through the rest of the ingredients. Arrange the salmon fillets, peppers and onion in a single layer on the prepared baking tray; and pour over half of the marinade. Toss peppers and onion to coat; and rotate the salmon to coat in the marinade. Broil / grill until the peppers are just beginning to char at the edges (about 10 minutes) and the salmon is cooked to your liking (about 10 minutes). Remove from the oven and serve immediately with lime wedges. 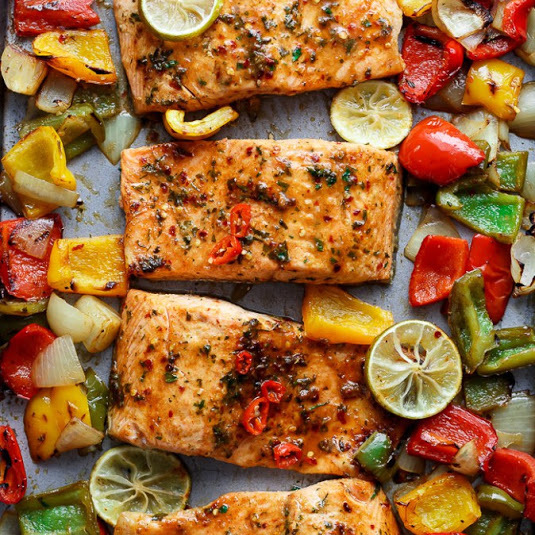 (If the peppers are not done to your liking, simply transfer the salmon to a plate and return peppers to the oven until roasted to your liking. This entry was posted in Citrus, Garlic, Peppers and tagged boise grocery delivery, buy local, chili lime salmon, grilled salmon, summer salmon, support family fisherman, sustainable fishing, wild caught salmon. Bookmark the permalink.